MAN Diesel & Turbo used its presence at the Marintec 2015 marine exhibition in Shanghai to launch its 175D high-speed engine in China. Ranked as one of the most important marine industry events in China, and attended by hundreds of international companies, Marintec was an evident choice as showcase for the engine. Dr Matthias Schlipf – 175D Project Manager – MAN Diesel & Turbo, said: “Launching the engine in China is an obvious step as it is such an attractive and vast market. The MAN 175D is compact, reliable and efficient – essential properties that facilitate safe manoeuvrability in even the most challenging of weather conditions. Featuring the best power to weight ratio in its class, I’m confident it will find a ready market in China, especially within the workboat, patrol boat and yacht segments." Originally launched in Europe towards the end of 2014, MAN Diesel & Turbo states that the 175D’s Chinese release was in great part due to local requests for a large, high-speed engine. Schlipf also noted: "The business case behind ordering such an engine also has to be right for the customer. And this is where the 175D sets standards in more than just fuel consumption. Our aspiration is to make the MAN 175D the most efficient engine in this market." The 175D’s overall, developmental process was heavily driven by customer focus. "Time and again, we were asked to develop a high-speed engine with a true 'MAN character', that is, a high-speed engine that works as reliably as a medium-speed engine and which has been tailor made for maritime use", said MAN Diesel & Turbo’s Florian Keiler, responsible for the business development and market launch of the MAN 175D. "Throughout the development stage, we spoke to customers around the whole world to get a detailed picture of their expectations and professional requirements. This feedback has been pumped directly back into the engine’s development process." The MAN 175D scores highly in terms of eco-friendliness. Its compact and modular exhaust-gas after-treatment system uses the selective catalytic reduction (SCR) method and is based on the MAN Ad Blue® technology that has undergone many thousands of hours of testing. The engine therefore already satisfies the strict IMO Tier III environmental standards before it hits the market. The 175D’s straightforward design also makes it quick and uncomplicated for customers to initially start up the engine and carry out maintenance work. 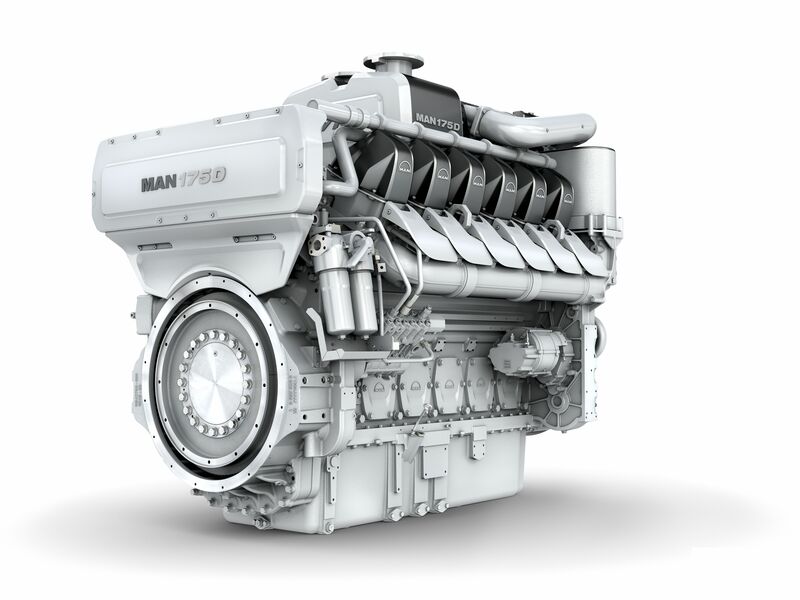 Finally, MAN Diesel & Turbo has also geared the MAN 175D as part of a high-speed propulsion package with a gearbox as well as MAN propellers and shafts in order to optimise efficiency.